Airsoft is undoubtedly an upcoming game that offers many unique values that “similar” sports like paintball cannot provide. Airsoft makes use of imitation guns that fire 6mm synthetic pellets that induce a slight sting when struck, enabling the opponent know they have been hit. Airsoft at the end of the day is really a game of integrity, so any cheating has to be rustled out by the marshals that lead the games at most of the game sites. There’s an added aspect of authenticity in airsoft as it’s equipment is very much orientated on duplicating genuine weapons, equipment and “load outs” This is the primary drive toward airsoft especially from ex- paintball players, as paintball can only be taken so far along with realism, as large HPA or co2 tanks draw attention away from the realistic aspect, even though nowadays there are HPA airsoft guns that take many aspects from the traditional paintball gun. Taking a look at the main percentage of airsoft guns, they do often replicate the exterior aesthetic, and even go through comparable internals with Gas Blow Back models replicating the internal function of an actual fire arm, with the only difference being the lack of combustion, rather making use of gas as a propellant instead of black powder. Overall games are setout in objective based games as it’s usually smart to blend specific accomplishments and goals through a regular game of “deathmatch”. Practical goals like keeping a location for some time, or searching the game site to have an item or type of “intel” is a well-liked game type, as it will get both teams working towards a goal that will force participants to conflict in certain locations. This can replicate real life active fire scenarios, as you can all of a sudden discover a whole number of the enemy team, meaning you’re going to have to use techniques to outwit your attacker. Although you may think that the airsoft gun, whether it’s an AEG, GBBR or possibly a HPA gun may be the most important part of your loadout, we must check out other aspects like your clothing, equipment and especially your protective equipment, as you want to get the best time you can, with the most amount of safety you can have. Airsoft is a hobby and can be an enjoyable activity, so you mustn’t lose sight( pardon the pun ) when it comes to protection. Sometimes you must forgo authenticity for the utmost safety since you do not want to be blinded because of a lack of sense and safety. This moves us on nicely to the first aspect, which we believe is an essential one because it stops you from being permanently damaged, as eye protection is key with regards to airsoft. Due to the nature of the projectiles in airsoft, its essential to have ballistic rated glasses that will protect your vision from the BB that is traveling at 300+ fps. Complete seal eye protection is definitely suggested, but this is where you can get some diversity depending on your requirements. Some players go for fine mesh goggles as this can stop the dreaded “misty goggles” because of condensation in plastic eye protection. Nevertheless fine mesh glasses have been known to let in shards of plastic in to the goggles even if they’re complete seal, as the small holes can let in ricocheted plastics from pellets that breakup from the impact. Full covered eye protection made from ballistic rated plastic can solve this, as the sheet of plastic has a full level of protection around your eyes. This can cause problems like clouding but products like anti– mist spray, as well as dish washing liquid can resolve these problems, as it can stop the build-up of condensation from the inside of your eye protection. This leads onto our next item of face protection as you can opt for lower face protection. In the UK, game websites have a tendency to require mandatory usage of lower facemasks with young players, and 18+ players may use it under their own personal discretion. Most CQB sites operate a compulsory face protection requirement as getting teeth shot out isn’t uncommon. It’s surprisingly common, as you can’t controla stray BB from hitting your mouth. For this reason we recommend lower face protection so much, as a £12 face mask is going to ultimately save on the dentist’s bill, as well as the pain that comes witha chipped Or shot tooth. You could think about an alternative choice having separate pieces as brands such as Dye have full facemasks, which integrate both bits of protective gear together. These full facemasks often have incorporated fans that also stop the fogging of your goggles, which is a great feature which comes from high- end paintball face masks. With your head literally covered, you should look at kitting out the rest of your body, as there is a plethora of things to choose from. Combat vests, chest rigs and plate carriers are all items you can equip yourself with making lugging things like extra magazines, ammo and side arms a piece of cake. These may be tailored for your load out, as numerous rigs are suited to specific camouflages or colour ways. If camouflage has to be your game, then maybe you should take into consideration a ghillie suit, which is the ultimate device of camouflage. Obtained from the military’s sniper school, the ghillie is really a total suit which uses various shades of burlap, which you can insert different vegetation to blend into your surroundings. Some may believe this is too far, but a DMR or sniper role is a very important factor in an valuable team, so Mil- Sim players might want to incorporate this into their strategy if they choose such positions. Taking a look at accessories for your chest rig, you could have things like magazine pouches, that are essential for any game that last longer than 10 minutes, as reloading is an important aspect of airsoft. Holsters for your sidearm will also be a vital way of keeping the sidearm near; as you don’t want to be losing your investment the very first game you are out in the game. Weapon slings can also be an effective way of keeping your main weapon slung on your torso as occasionally trips and drops may happen. Keeping your airsoft gun near to you is also a great aspect when you switch to your sidearm, or have to carry an in- game item, which demands two hands. 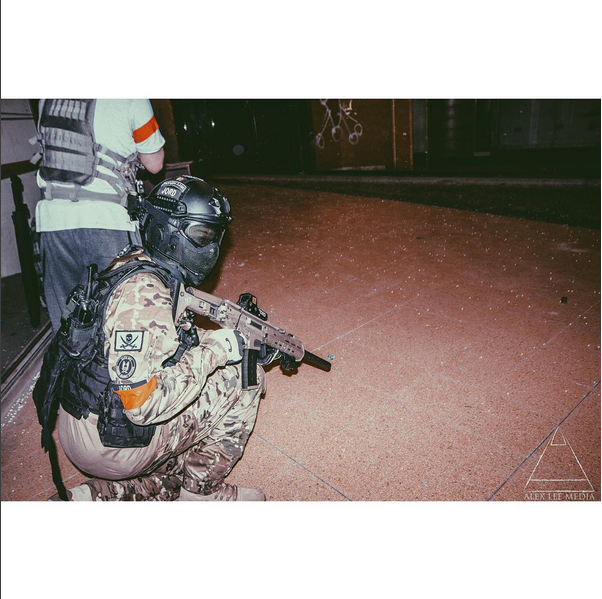 There really are a huge number of items you can use in airsoft that will help you in game, as airsoft is a game of realism a lot of the time, do your homework and find out what you like, as this is the best way to inform yourself on a load -out that you are happy with, and therefore are proud to call your very own. Be the first to comment on "Airsoft – Clothing, Equipment and Protection"